there is a way to feel better? there is a way to eat better? there is a way to move better? No matter where you are starting from there is a possibility of finding improvement. Some of the habits and exercises may be difficult but what if some of them are easy, what if some of the skills you can learn and practice help you feel better? You don’t need to have the answers to these questions right now. Simply pose these questions to yourself. Then sit back and relax. We simply want to create a higher level of possibility in your current situation. Asking yourself questions like these helps get the ball rolling and produces space for answers to come in the near future. Ask yourself, “what if I was able to feel, eat, and move better?” What would that look like to you? John Wooden, the legendary basketball coach at UCLA, placed industriousness and enthusiasm as the two cornerstones of his “Pyramid of Success”  that he used to win 10 national championships – 7 in a row – in a 12-year span! He understood the importance of training one’s mind to overcome challenges. Industriousness, Coach Wooden said, is “simply that you have to work and work hard…Worthwhile things come only from work.” With IBD the idea of “hard work” might sound a little harsh or stressful, possibly conjuring images of running countless sprints or following an intense diet plan. I offer my approach to hard work with your IBD as simply, doing what you need to do to get the outcomes you desire. Repurpose the idea of “hard work” as simply doing what is necessary to achieve what you desire. If we begin to go about our “hard work” with purpose and gratitude knowing that the work is beneficial then that “hard work” somehow doesn’t feel so hard. Everyone has at least one thing in life that they get excited about. And if it is possible to simply feel excitement, or enthusiasm, about something then we can learn how to carry that over into other larger areas of our lives. Maybe you are enthusiastic about a certain show on Netflix? You enjoy the preparation that goes into settling in to watch the show. You enjoy the people you watch it with or maybe the solitude and escape if you watch alone. The point is that this enthusiasm is within you. Now ask yourself, could you feel enthusiastic about improving your mindset to help you live a better life with IBD? What has seemed too challenging or too big of a task to even begin? Without even physically doing anything about it just yet, take a few seconds and imagine your challenge again but this time you feel enthusiastic about the hard work needed to achieve success. How does that feel? What are you enthusiastic about now – or what have you been enthusiastic about in the past? Just for today, could you recapture that enthusiasm? Could you take it and apply it to something that would help improve your IBD – something that maybe felt like “hard work” but could somehow feel enjoyable? What would that look like? A consistent trait I find amongst those living with IBD is an underlying resiliency. Living with IBD can teach you that life can be very tough, unfair, and painful. However, I often find that those given the greatest challenges find ways to endure and overcome, again and again. That is living with resilience and that is a great sign of strength. 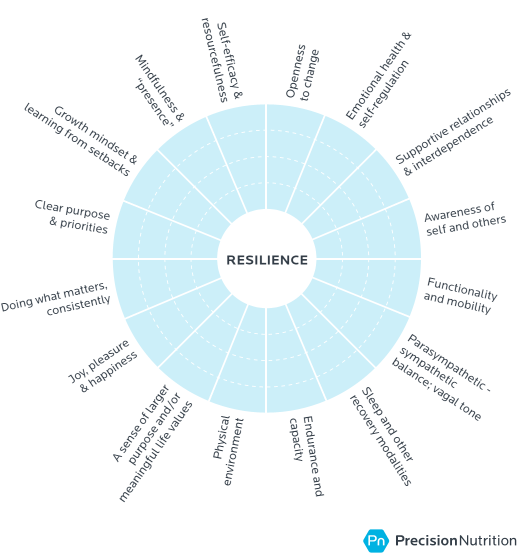 Use this Precision Nutrition resource to discover just how resilient you are! Color in each wedge with how resilient you feel you are in each area. The more of each wedge you color in, the more resilient you are in that domain. Share your results with a close family member or friend. Quick, imagine someone sad and depressed – What does their body language look like? Where are their eyes looking? How about their shoulders? Down and slumped or up and back? Now imagine someone happy, thrilled, and overjoyed by news of a clean bill-of-health – How is this person moving? Where are their eyes looks? Maybe up and out towards the horizon? How about their shoulders and body posture? Are the shoulders up and back, proud and tall? What does any of this have to do with IBD? Power posing, a term coined in Amy Cuddy’s TED talk, is the idea that our movement and posture (how we move and hold our body in space) affects our physiology (how are body functions). Simply by standing up taller or taking up a bit more space in your immediate environment you can alter and improve hormone levels like testosterone while lowering stress hormones like cortisol. Do you think this could help you think, feel, move, and even eat better? Without ANY side-effects…except for the chance of improved well-being, confidence, and outlook towards the world. Not too bad for a few seconds of improved posture. 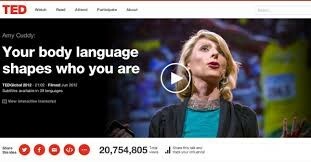 Watch Amy Cuddy’s Ted talk in the above link. Practice a power pose (arms outstretched overhead) for 30-60 seconds. Notice how you feel before and then after. Is this something that you could easily adopt into your daily habits? Remember, people are usually a combination of several superpowers. Most people fall into multiple categories. Review the above info – notice what superpowers resonate with you. See if you can live them just a little bit more today. Try this habit for the next 3-7 days. The legendary UCLA basketball coach John Wooden coined his definition of success in 1934 when he was a high school English teacher. He noticed that students had different levels of skill and ability. Some were better athletes than students and vice versa. In his English class, he noticed that one student could work up to his highest level of ability and earn a ‘C’ letter grade. Another student (maybe with much more advanced abilities) had the ability to earn an ‘A’ but only put enough effort to achieve a ‘B’ letter grade. Which student would you consider a success in this example? Sometimes we can distract and frustrate ourselves when we compare our situation with IBD to others without this condition. So take a pause, a nice deep breathe, while you consider what you want to be your rules to gauge your achievements and success. A simple way to do this is to define what success means for you. Give it a realistic timeframe. Give it an actionable and do-able quality. An example might look like this. Defining success is yours and yours alone. Whatever you choose to make it resonate with you, make it motivating, and make it something that you feel comfortable and confident in achieving. Enjoy your moment when you achieve your success. Savor it! Then quickly set another definition of success that will help you improve your life with IBD. Write out your current definition of success with your IBD. Option A – Fight or flight – your sympathetic nervous system (SNS) over-activation. If you notice that you are feeling too much stress then you are likely “on guard” and going through over-activation of your sympathetic nervous system. So what does this have to do with feeling better with IBD? When you perform the habit of “Opposite Day” you allow yourself the opportunity to get back to neutral, relax a little, and regain a healthy composure that will enable you to better manage any potentially stressful event in the future. Use either option to help restore your body’s stress response back to neutral and begin to feel more relaxed and calm. Remember when you practiced the 5 minute meditation? Use that time to assess your current stress levels. Do you need to relax or release tension? Perform the necessary technique from above as often as needed today.